Eternity rings are said to be a symbol of everlasting love. They are usually gifted at a momentous time in a relationship. We have decided to do this week’s blog about all things eternity ring. Their origin, when to give one and how to wear it them. The concept of eternity rings is believed to have stemmed from Egyptian times so they’ve been around approx 4,000 years or more. The style of these eternity rings varied greatly from extremely ornate featuring many gemstones to very simple made with pebbles and simple metal. However, the common theme throughout is the circular metal band which acted as a symbol of the circle of life and of course, represented eternity. There were no set rules back then as to what an eternity ring should look like or when was the most appropriate time to give one, so clearly not much has changed. Once eternity rings began to be monetized, the romantic notion seemed to be slightly lost. An entrepreneur, DeBeers, saw a clear money-making opportunity in the diamond market. It is believed that he made a deal with the Soviet Union that in exchange for some high quality diamonds. DeBeers had to buy 95% of the uncut diamonds produced in Russia. These diamonds were a lot smaller than the diamonds that were popular in the market at the time. His solutions as to what to do with all of these small diamonds, he decided to put as many as he could in one ring. The concept of eternity rings was born. He marketed them towards older, married women and One of his slogans was “She married you for richer or poorer. Let her know how it’s going”. Although this doesn’t quite paint the romantic image the Egyptians were going for, nowadays, people are going back to the true roots of the eternity ring. It is a symbol of love and life and is given as a token of that. 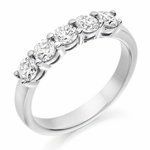 What Does the Eternity Ring Represent? Eternity rings are a way of showing your appreciation and love for your partner. As mentioned, the Egyptians saw that the circular band would symbolise the everlasting nature of love and that it will continue forever. The symbol of everlasting love is also why the eternity ring is sometimes called an infinity ring. However, the ring doesn’t have to be purely associated with marriage as it also can represent the circle of life. As mentioned, there is no set time as to when to give an eternity ring, it really depends on when an individual feels that the time is right. However, a popular times that people have given them are on an anniversary. A diamond is supposed to be given on the 60th anniversary, however, we don’t blame you if you can’t wait that long! A more modern version of that list would say that diamonds can be gifted on either the first or the tenth wedding anniversary. The second meaning of these rings, the circle of life, people often give an eternity ring upon the birth of their first child. So, the ring can be given to commemorate love or to celebrate the growth of the family. Again, there are no rules as to how best to wear an eternity ring. Some people may decide to wear it on their ring finger on their left hand, along with their wedding and engagement ring. It is suggested that you put your wedding ring on first, followed by your engagement ring and then finally your eternity ring. In reality, the order of those doesn’t really matter, it’s whatever you feel looks the best together. You could also wear it on the right hand, on the equivalent finger ( or on any finger). The rules of the eternity ring really don’t exist so the freedom to choose is all yours! What Should an Eternity Ring Look Like? Early eternity ring styles featured just a ring of metal, sometimes precious, sometimes not. These were set with stones along the top half of the ring or else all along the circumference of the ring. An early example of an eternity ring, depicted a snake eating its own tail… we’re definitely glad styles have changed! Nowadays, there are two main styles of eternity rings. A full eternity ring features diamonds/gemstones the whole way around. A half eternity ring has diamonds along the top face of the ring. Diamonds are the most popular choice for an eternity ring. Rubies, sapphires and emeralds are definitely an option but these are usually featured in conjunction with diamonds. In terms of design, a half eternity ring is a wiser option as a full eternity cannot be resized later. Keep in mind that a full eternity ring can also cost 2 to 3 times the price of a half. The jump in price is due to the increase in the number of diamonds. Another trend that is on the rise is maternity rings. These are given to a woman when she is pregnant. The idea is that you get a pink stone (such as morganite, pink sapphire..) if it’s a girl or say, a sapphire, if it’s a boy. These are a meaningful gift to receive and one that would be treasured forever. 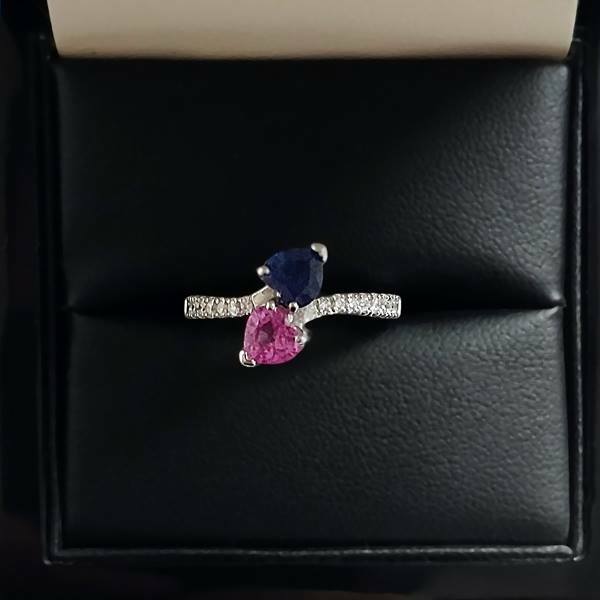 Even if you don’t know the gender in advance, we have styles such as the one featured, that includes both a pink and blue stone! So, the eternity ring can take on many meanings and can be given whenever you feel is right. The eternity rings’ style is constantly evolving. You can choose to have it complement your engagement and wedding rings or else can be a completely different style to both! There is no set way as to how it should look, how it should be worn or even when it should be gifted. The ambiguous nature of the eternity ring is why we love it so much! See here for our range of eternity rings.